The Latin Songwriters Hall Of Fame 2nd Annual Induction Gala is Saturday, October 18th, 2014 at The Ritz-Carlton, South Beach (Miami Florida). Tickets and the Event Program Congratulatory Ads are on sale now. Celebrate and honor the world’s greatest Latin music creators, their unforgettable songs and help develop future generations of songwriters through our workshops, showcases and scholarships. Click here to download the full invitation. 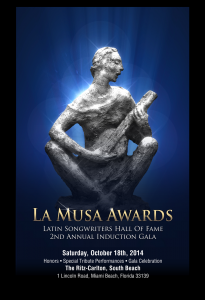 or visit the website for more info: http://www.latinsonghall.org.